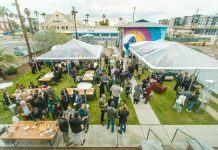 The historical approval of Tempe Prop 418 Code of Conduct reform charter amendment, by an overwhelming amount of at least 78 percent of Tempe’s voters (Arizona Republic, November 6, 2018), represented more than a democratic victory. This victory also represented the failure of the Prop 418 misinformation campaign used by Councilman Kolby Granville and other Prop 418 opponents. In addition, the Prop 418 public dialogue exposed the voter information legal intimidation tactics, used by attorney Mr. Granville himself. Mr. Granville who has two council ethics violations on his record, was fired as a high school teacher in December 2017, by Tempe Prep public charter high school (Arizona Republic, January 18, 2018). This occurred after former Tempe Prep students reported that Mr. Granville illegally provided them with alcohol when they were minors, and sexually assaulted one of them. Evidently, Mr. Granville might have been jolted by with the potential prospect of losing another public job, while serving on the Tempe City Council. Originally, Mr. Granville vociferously claimed that Prop 418 would mean that a council member could be removed for swearing at a referee at a non-city event (Arizona Republic, May 8, 2018). In response, City Attorney Judi Baumann told Mr. Granville and the Council, that Mr. Granville’s contention was not accurate. After Mr. Granville read a public ballot argument in favor of Prop 418 before it was published, submitted by this writer, attorney Mr. Granville immediately threatened possible legal action against both the City of Tempe and this writer, if the argument was not withdrawn prior to publication (Granville e-mail dated August 10, 2018)). The withdrawal of the subject ballot argument was never considered. When Mr. Granville failed to act on his threat of possible legal action, his voter information legal intimidation tactics and his legal impotence, became public knowledge by means of a public information request made to Tempe City Hall. Mr. Granville was the only citizen to write a public ballot argument against Prop 418. Using bizarre reasoning skills, he also wrote a public argument in favor of Prop 418 as well (Tempe Election Publicity Pamphlet, Election of November 6, 2018) . Later when Mr. Granville decided to be against Prop 418 once again, Mr. Granville became the only person who paid for social media advertising against Prop 418. While Mr. Granville was doing this, in an unpaid social media campaign directed at Tempe neighborhood groups, Mr. Ron Tapscott who was a one of Granville’s anti-Prop 418 allies, argued that Prop 418 would ensure that a councilmember could be removed from office, if the councilmember stole a pack of gum from a store, and the store owner decided not to prosecute (Tapscott social media public posting dated October 13, 2018). 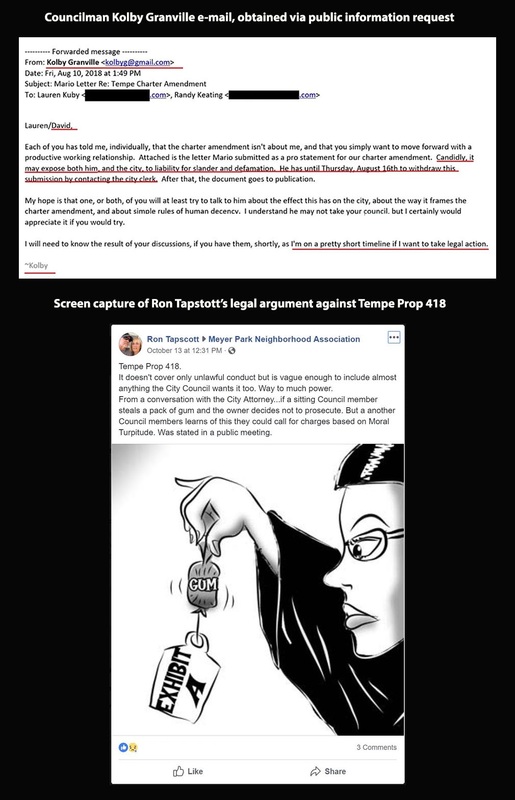 In conjunction with this public statement, Mr. Tapscott published a cartoon of a legal professional holding up a wad of gum as legal evidentiary matter, to make his Prop 418 legal expertise clear. Against this campaign by the anti-Prop 418 forces, a group of diverse community activists adroitly organized in support of Prop 418. 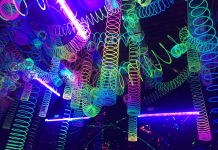 These activists included two Tempe City Councilmembers with no ethics violations. Another key supporter was a member of the Tempe High School District School Board, who also had no ethics violations. Prop 418 was also endorsed by the political action committees of Tempe Police Officers and Tempe Firefighters, who had leaders who were never fired for sexual misconduct. These influential endorsements were followed by Arizona Planned Parenthood, Changing Hands Bookstore and AZResist.org. Rather than concentrate on rhetorical legal absurdities, these groups addressed the real issue. The truth is that Prop 418 improves our system of Tempe government accountability. This was the election winning argument. 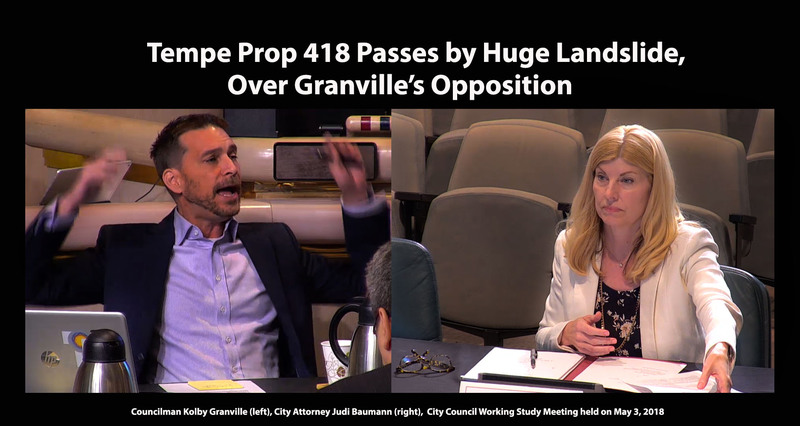 When over 78 percent of the Tempe voters voted YES on Tempe Prop 418 Code of Conduct reform, it became clear that Mr. Granville’s intimidation tactics, and the misinformation campaign against Tempe Prop 418 had failed.